Psychic VR Lab Co., Ltd. (Head office: Shinjuku Ward, Tokyo / CEO: Hiroyuki Yamaguchi) that provides a VR creative platform, ‘STYLY ’, co-operated on a mashup MV with fan-made VR space, ‘Natsu on Blue’, released by the new wave girl group, ‘You’ll Melt More!’, by providing STYLY as a VR-space creation tool. ‘Natsu on Blue’ is an electro pop tune with the theme of summer, which ‘You’ll Melt More!’ have been performing since their debut. It’s written by Ai Kobayashi and composed and arranged by Tamptin. 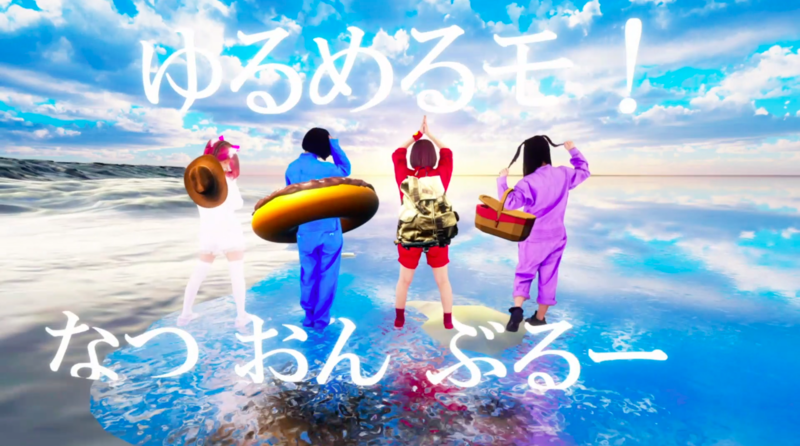 This MV originated from a VR costume exhibition to mark the release of the first best album, ’MUSIC GO ROUND – Yoru Best! –‘ by ‘You’ll Melt More!’ in this May. At the same time, we invited the fans to co-operate in making the MV for “Natsu on Blue’. By using STYL, this mashup MV has been created as the collaboration with various VR spaces provided by the fans. The director of this MV is Mani Kato who provided many works for ‘You’ll Melt More!’ such as ‘Nigenai!! (Don’t Run Away! )’, ‘Summer BOKAN’, ‘Okoranaide(Don’t be angry)’, ‘DAHLIA’, etc. ‘You’ll Melt More!’ is now on nation-wide tour in Japan. The ‘double’ final concerts are planned in Zepp Tokyo and Zepp Namba. The ticket is now on sale.